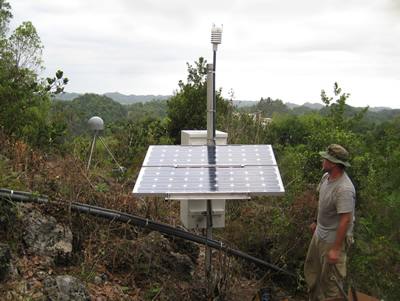 In May of 2008 UNAVCO Engineers Abe Morrison and Sarah Doelger installed three of the six new CGPS stations to be placed around Puerto Rico and the US Virgin Islands. These installations included a site at the Arecibo Observatory, the Bayamon Science Park, and one on Caja De Muertos Island. The next group of installations later this fall will include St. Croix in the Virgin Islands, Culebra Island off the northeast coast of Puerto Rico, and Mona Island midway between the west coast of Puerto Rico and the Dominican Republic. This project will develop a real broadband earthquake observation system at seismic stations of the Puerto Rico Seismic Network. A set of co-located broadband velocitymeter and accelerometer instruments have been operating at these stations for many years. The combined system will record much longer period seismic waves, which is critical to monitor large earthquakes (e.g., M>8.0), particularly tsunamigenic earthquakes, and study long-period earthquake ground motions. Lessons from the Dec. 26, 2004, Andaman Islands-Sumatra Earthquake (M 9.2) indicated that it is difficult to get true size of very large earthquakes using the information recorded by current seismometers because of the loss of long-period information. The true size and tsunami potential of these earthquakes can be determined accurately using only 15 minutes of GPS data after the earthquake initiation. The seismicity of Puerto Rico and northeastern Caribbean region (including the U.S. and British Virgin Islands) is monitored jointly by the Puerto Rico Seismic Network and the Puerto Rico Strong Motion Program, both operating within the University of Puerto Rico at Mayaguez (UPRM). The Puerto Rico Seismic Network has also been developing a tsunami early warning system for the Caribbean region. However, the existing modern digital broadband seismic observation system is not a real broadband system. Modern velocitymeters and accelerometers have disadvantages in correctly recording long-period (e.g. larger than 30 sec for accelerometers and 150 sec for velocitymeters) seismic waves. Long period seismic waves, as well as permanent ground displacement information, are critical for detecting tsunamigenic earthquakes. High-rate (1-Hz) GPS is a good tool for earthquake studies and understanding fault rupture and its induced strong ground motions. Figure 1 - UNAVCO Engineer Abe Morrison surveys the completed Arecibo CGPS station that is located on the grounds of the Arecibo Observatory. 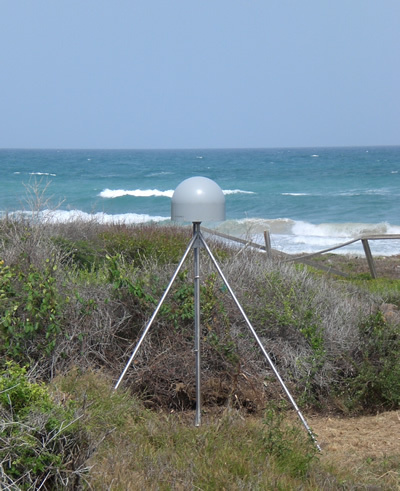 Figure 2 - The installed CGPS site on Caja De Muertos Island. Caja De Muertos island is a wildlife refuge located about 10 miles off the coast of Ponce PR. The Island is administered by the Department of Natural Resources who granted permission for this project to install the SDBM site. Figure 3 - UNAVCO Engineer Sarah Doelger holds an impromptu class on how to use the hammer drill, used to drill the holes for the GPS monument legs. 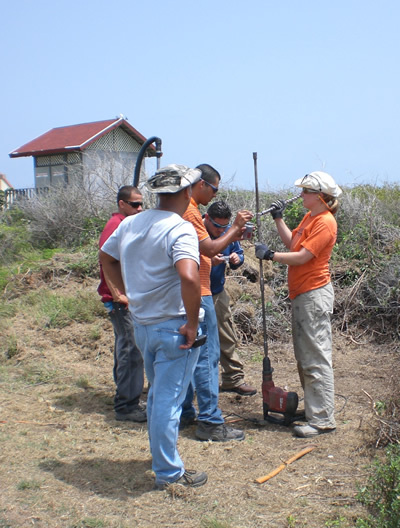 The interested onlookers are technicians from the university of Puerto Rico Mayguez and the Puerto Rico Seismic Network.